And so we start our second year of WFNC. April is my favourite month and spring is a good time for new beginnings. The team consists of Dominique Nancy of 3C Style in Canada, Lisa Lawrence of Lismore Paper in the USA, and myself in the UK. We work closely each month to bring you three intertwined posts with a common theme. We are all three very creative people who met via our WP blogs. We have a shared ethos and a close friendship. Our motto – ‘An ocean apart but we share the same heart’ describes us perfectly. The five hour time difference means I spend my morning commute catching up with their conversations during the night, and waiting for them to wake up so I can join in! Make sure you visit Dominique and Lisa via the links above, to see the whole of the post. Protea is a genus restricted to Southern Africa. The family is a classic component of the ‘Fynbos’ habitat and is fascinating for its various adaptations to pollination, fire and seasonal drought. P. cynaroides, The King Protea has the largest flowers – dinner plate sized – and is pollinated by large scarab-like beetles which are really cool in themselves – see here. The species is widespread in South Africa and has forms which flower at various times of the year. I have grown it but it has to be grown in pots here and protected in winter. The photos were taken near Cape Town 20 years ago. Above collage, coral art, Land Sea Earth image by Lisa. Model, concept, styling by Dominique, Flower photo, Darren. Calanthe is a genus of over 200 terrestrial orchids from most tropical parts of the world. The genus includes mostly tropical species but there are a few from Japan, the Himalaya and China which are totally hardy through our winters. In Japan there are countless hybrids and even a dedicated society of enthusiasts. I first grew them in the mid 1990s when some bulb nurseries started offering them. To be honest the plants were weak and virused and poor growers. More recently fresh material has become available, including a range of vigorous hybrids grown from seed or micropropagated in Europe. These are much more vigorous, healthy and cheap. This particular plant has only been in my care for two weeks but if memory serves they like a spot free from strong winds, are quite appealing to slugs and snails and like more nutrients than most orchids. 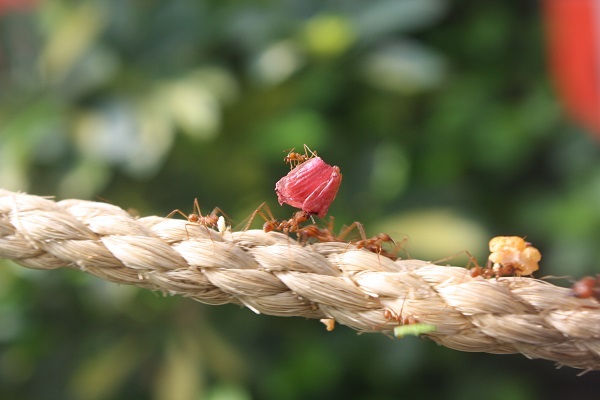 There are several species of Leaf cutter ants. They cut pieces from leaves and flowers and carry them in a procession back to their nests where they eat the fungus that grows on the decaying leaves. This photo was taken in the mini-beasts area at a local zoo. The process seems to be directed by the little bossy one being carried by the others. For some reason it makes me think of the day job. Ants pop up in new designs created for our Threadless shop by Lisa, from one of Dominique’s notions.. More about these next time and/or over on Lisa’s blog! Concept by Dominique. Pop of Coral art by Lisa. Courgette flower drawing by Darren. I have shown in-progress pictures of this previously as it was sketched from life during my trip to Montreal in September, with the colour added later at home. Dominique laid them out on a plate and is responsible for the composition. There are very fond memories associated with this drawing. And now it has been used in one of the team designs this month. It is so far proving not too easy to grow, but I have not yet killed it! I was delighted to find out that my story has been chosen as one of those featured in the upcoming Creativity Special issue of Happiful magazine! If you are visiting because of this article, then a warm welcome to you! Whilst the topic of mental health can be a difficult one, I hope you will find humour here. And hope too. This blog has been crucial to my own growth over the last two years, and the friends I have made as a result are a source of great joy. I have updated my bio with more information. This particular post is part of a collaborative series that sprung from friendship with other bloggers. Some of my work features in designs created with my partners-in-crime linked in this post. These are very much team efforts (a lot of fun) and, as ‘Fashioned by Nature’, we have a team shop on Threadless. My more traditional botanical art will be made available, mostly as signed prints, via a shop on NuMonday, but for now you can order direct from me, see details here. Three of my originals will be exhibited (and available for sale) at the Society of Botanical Artists exhibition ‘Plantae‘ from June 5th in London. You may have had glimpses of these hugging/dancing chillies before on IG. These have been applied to designs for Threadless and are already available there. But there is much more to come next week- we have been very busy! Thank you Lisa. I will pop over and visit you in a few minutes and see what you have been up to! Have a big hug from me too my friend! Such beautiful photos Darren and I’m sure you are excited that you won’t have to deal with the time lag soon when you get to meet and plan face to face! Thank you dear Dominique😍. You two make me laugh a lot too, and are constant inspiration too. But, better than that, you help me push my boundaries creatively and personally and that is a huge thing. With regards the news, well I will try to do as you say – enjoy without stress! They will at this rate! First of all congrats to be featured in happiful magazine and well done to exhibit ur originals on next plantea👏🏻👏🏻👏🏻Second I so loved this month issue and your post. I love all these photographs Darren but the Protea is my favourite of the flowers. It usually gets a big showcase at Chelsea. Thank you! Yes the Kirstenbosch display at Chelsea is legendary but I have never been. I do have some very tiny seedlings of this again but will have to wait a few years! It never ceases to amaze me when I see the collaboration between you three. Every month I pick one of your posts to look at first. If I see yours first, the plants color the way I see Lisa’s artwork and Dominique’s fashion stylings. If I see Dom’s fashion first, then I see your plants a bit differently. This month I looked at Lisa’s post first and her lovely artwork sent me down a different path when looking at your and Dom’s posts. Then when I put the whole together, it’s a new thing all around. This probably makes little sense, but at least you know I love it!